Spinel-structured transition metal oxides are promising non-precious-metal electrocatalysts for oxygen electrocatalysis in rechargeable metal–air batteries. We applied porous cobalt manganese oxide (CMO) nanocubes as the cathode electrocatalyst in rechargeable seawater batteries, which are a hybrid-type Na–air battery with an open-structured cathode and a seawater catholyte. The porous CMO nanocubes were synthesized by the pyrolysis of a Prussian blue analogue, Mn3[Co(CN)6]2·nH2O, during air-annealing, which generated numerous pores between the final spinel-type CMO nanoparticles. 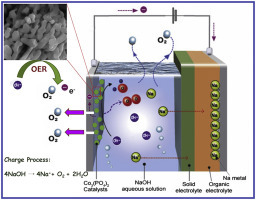 The porous CMO electrocatalyst improved the redox reactions, such as the oxygen evolution/reduction reactions, at the cathode in the seawater batteries. The battery that used CMO displayed a voltage gap of ∼0.53 V, relatively small compared to that of the batteries employing commercial Pt/C (∼0.64 V) and Ir/C (∼0.73 V) nanoparticles and without any catalyst (∼1.05 V) at the initial cycle. This improved performance was due to the large surface area (catalytically active sites) and the high oxidation states of the randomly distributed Co and Mn cations in the CMO. Using a hard carbon anode, the Na-metal-free seawater battery exhibited a good cycle performance with an average discharge voltage of ∼2.7 V and a discharge capacity of ∼190 mAh g–1hard carbon during 100 cycles (energy efficiencies of 74–79%). Amorphous (a-) Sb2S3 nanoparticle aggregates were synthesized using a facile polyol-mediated process at room temperature and their Na-ion storage capability was evaluated. Owing to the spherical nano-aggregate morphology and amorphous structure, the a-Sb2S3 anode exhibited superior rate capability and cycling stability compared to that of crystalline, microscale Sb2S3 particles. The a-Sb2S3 electrode was also examined as an anode for eco-friendly, Na metal-free seawater flow batteries. Metal fluorides (MFx) are one of the most attractive cathode candidates for Li-ion batteries (LIBs) due to their high conversion potentials with large capacities. However, only a limited number of synthetic method, generally involving highly toxic or inaccessible reagents, currently exist, which has made it difficult to produce well-designed nanostructures suitable for cathodes; consequently, harnessing their potential cathodic properties has been a challenge. Herein, we report a new bottom-up synthetic method utilizing ammonium fluoride (NH4F) for the preparation of anhydrous MFx(CuF2, FeF3, and CoF2)/mesoporous carbon(MSU-F-C) nanocomposites, whereby a series of metal precursor nanoparticles pre-confined in mesoporous carbon were readily converted to anhydrous MFx through simple heat treatment with NH4F under solventless conditions. We demonstrate the versatility, less-toxicity, and efficiency of this synthetic method, and, using XRD analysis, propose a mechanism for the reaction. All MFx/MSU-F-C prepared in this study exhibited superior electrochemical performances, through conversion reactions, as the cathode for LIBs. Especially, FeF3/MSU-F-C maintained a capacity of 650 mAh g−1,FeF3 across 50 cycles, which is ~90% of its initial capacity. We expect that this facile synthesis method will trigger further research into the development of various nanostructured MFx for use in energy storage and other applications. Concerning the safety aspects of high-voltage Li-ion batteries, a pelletized hybrid solid electrolyte (HSE) was prepared by blending Li7La3Zr2O12 (LLZO) ceramic particles and an ionic liquid electrolyte (ILE) for use in pseudo-solid-state Li-ion batteries. The LLZO particles are enclosed by the ionic liquid as a LLZO–ILE matrix, and are quantified by FESEM elemental mapping. The chemical stability of the LLZO in the ILE is confirmed by powder XRD and FT-IR analysis. The HSE, with an optimized weight ratio of 80% LLZO, 19% Py14TFSI, and 1% lithium bis(trifluoromethanesulfonyl)imide, exhibits good thermal stability, even at 400 °C. The optimized HSE reveals an ionic conductivity of 0.4 × 10−3 S cm−1 and an electrochemical stability of 5.5 V with Li metal. Pseudo-solid-state Li-ion cells are fabricated using the HSE, and afford initial charge–discharge capacities of 140/130 mA h g−1 (Li/HSE/LiCoO2) with 99% capacity retention at the 150th cycle. The scope of the HSE is widened to high-voltage (>8 V) pseudo-solid-state Li-ion batteries through a bipolar stacked cell design. Dendrite formation is hindered during cycling in the Li-ion cell. Hence, the present investigation will greatly contribute to the next generation of high-voltage pseudo-solid-state Li-ion batteries. To investigate geometric and electrochemical characteristics of Li ion battery electrode with different packing densities, lithium cobalt oxide (LiCoO2) cathode electrodes were fabricated from a 94:3:3 (wt%) mixture of LiCoO2, polymeric binder, and super-P carbon black and calendered to different densities. A synchrotron X-ray nano-computed tomography system with a spatial resolution of 58.2 nm at the Advanced Photon Source of the Argonne National Laboratory was employed to obtain three dimensional morphology data of the electrodes. The morphology data were quantitatively analyzed to characterize their geometric properties, such as porosity, tortuosity, specific surface area, and pore size distribution. The geometric and electrochemical analysis reveal that high packing density electrodes have smaller average pore size and narrower pore size distribution, which improves the electrical contact between carbon-binder matrix and LiCoO2 particles. The better contact improves the capacity and rate capability by reducing the possibility of electrically isolated LiCoO2 particles and increasing the electrochemically active area. The results show that increase of packing density results in higher tortuosity, but electrochemically active area is more crucial to cell performance than tortuosity at up to 3.6 g/cm3 packing density and 4 C rate. With the increasing demand of cost-effective and high-energy devices, sodium–air (Na–air) batteries have attracted immense interest due to the natural abundance of sodium in contrast to lithium. In particular, an aqueous Na–air battery has fundamental advantage over non-aqueous batteries due to the formation of highly water-soluble discharge product, which improve the overall performance of the system in terms of energy density, cyclic stability and round-trip efficiency. Despite these advantages, the rechargeability of aqueous Na–air batteries has not yet been demonstrated when using non-precious metal catalysts. In this work, we rationally synthesized a binder-free and robust electrode by directly growing urchin-shaped MnO2 nanowires on porous reduced graphene oxide-coated carbon microfiber (MGC) mats and fabricated an aqueous Na–air cell using the MGC as an air electrode to demonstrate the rechargeability of an aqueous Na–air battery. The fabricated aqueous Na–air cell exhibited excellent rechargeability and rate capability with a low overpotential gap (0.7 V) and high round-trip efficiency (81%). We believe that our approach opens a new avenue for synthesizing robust and binder-free electrodes that can be utilized to build not only metal–air batteries but also other energy systems such as supercapacitors, metal–ion batteries and fuel cells. Herein, we report the preparation of highly porous N-doped carbons (PNCs) via thermolysis of nonporous Zn-based coordination polymers (CPs) constructed with nitrogen-containing ligands. So far, the thermal conversion of Zn-CPs, including metal–organic frameworks (MOFs), has mainly yielded microporous carbon materials, and to change the textural properties of end carbons, new CPs/MOFs with different properties were introduced. However, present studies show that just varying the conversion conditions of a parent CP results in porosity-tuned PNCs, in which especially mesoporosity is developed, and this is applicable for even nonporous CPs. This is conducted based on the understanding of conversion phenomena which is that during thermal conversion of Zn-based CPs, the in situ generated Zn metal species act as porogens and their agglomeration can be controlled by the reaction conditions. Different reaction temperatures, ramping rates and retention times allow control over the ratio of micro- to meso-pore volume, while a slower ramping rate and longer retention time at lower heating temperature induced the agglomeration of the porogens, yielding greater mesoporosity, and holding the Zn-CPs at high temperature for a short period afforded the micropore-dominant PNCs due to rapid porogen elimination. The superiority of the mesopore-developed PNCs as electrocatalysts, attributed to greater mass-transport-accessible surfaces, was examined for the electrodes in a rechargeable seawater battery system as an example of a practical application. Therefore, our synthetic approach provides a facile method for the preparation of PNCs with suitable hierarchical pore distributions for use as energy-related materials without exerting significant effort in the design of coordination compounds. Journal of Materials Chemistry A, 2016, 4, 7207-7213. - featured in 2016 J. Mater. Chem. A Hot papers. The effective use of electricity from renewable sources requires large-scale stationary electrical energy storage (EES) systems with rechargeable high-energy-density, low-cost batteries. We report a rechargeable saltwater battery using NaCl (aq.) as the energy source (catholyte). The battery is operated by evolution/reduction reactions of gases (mostly O2, with possible Cl2) in saltwater at the cathode, along with reduction/oxidation reactions of Na/Na+ at the anode. The use of saltwater and the Na-metal-free anode enables high safety and low cost, as well as control of cell voltage and energy density by changing the salt concentration. The battery with a hard carbon anode and 5 M saltwater demonstrated excellent cycling stability with a high discharge capacity of 296 mA h ghard carbon−1 and a coulombic efficiency of 98% over 50 cycles. Compared with other battery types, it offers greatly reduced energy cost and relatively low power cost when used in EES systems. The atomic structural and electrochemical properties of Fe substituted nano porous LiMn1-xFexPO4 (x = 0–0.8) composites are investigated and compared. X-ray scattering method is used for atomic structural investigation. Rietveld refinement shows that all Fe substituted composites have the same olivine structure (Pnma) with lithium occupying octahedral 4a sites, Fe2+ replacing Mn2+ at the octahedral 4c sites. The a, b, c parameters and cell volume decrease with the addition of Fe2+. When the nano porous LiMn1-xFexPO4 composites are evaluated as cathode materials in lithium cells at room temperature, x = 0.6, and 0.8 resulted in the best overall electrochemical performance, exhibiting stable cycling and high discharge capacities of 149 and 154 mA h g−1, respectively. 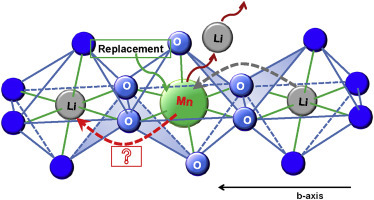 The composites with above x = 0.4 show a fast lithium ions transfer with high electronic conductivity because Fe transition metal substitution reduce the partly occupation of Mn in the M1 (LiO6) sites and thereby Mn block the lithium ion diffusion pathway. We here firstly find the antisite defect in the high Mn content in porous LiMn1-xFexPO4 composites. Encapsulation of organic active materials in carbon nanotubes for application to high-electrochemical-performance sodium batteries. Sodium (Na) ion batteries are interesting candidates for replacing lithium (Li) ion batteries, primarily due to the abundance of Na in the environment. However, the performance and energy density of a Na-ion battery are inferior to those of a Li-ion battery. Organic active materials can help overcome the drawbacks associated with Na-ion batteries because of their many advantages. However, such organic polymer electrodes are subjected to a high self-discharge and low practical capacity because the polymer electrode easily dissolves in an organic electrolyte and forms an insulating layer. Therefore, in this study, we have designed a unique organic electrode in which an active polymer is encapsulated into a carbon nanotube (CNT) to form an electrode with high polymer content. The CNT is able to retain the active polymer within the electrode structure, providing an effective electronic conduction path. Moreover, the CNT can contain large amounts of active polymer and therefore exhibits superior electrochemical properties without self-discharge, making it well suited for use as a cathode material in a Na-ion battery. A new system of lithium recycling is designed to recover Li from materials containing waste Li. This waste-to-lithium (WTL) system operates based on electrochemical reaction at room temperature using three functional sections: two cathode compartments, one for the waste materials and one for recycling the recovered Li, and one Li-harvesting anode compartment located between the two cathode compartments. By charging the system, Li ions from waste Li-containing materials are extracted and converted into Li metal in the harvesting anode compartment. The harvested Li metal can be transformed via electrochemical reactions with water into useful Li precursors such as LiOH and Li2CO3, which are commonly used Li source chemicals. The concept of the WTL system is proved using well-known cathode materials from Li ion batteries and a commercial Li ion battery pack as the waste Li-containing materials. The harvested Li metal shows a purity of ∼99%, and the produced Li2CO3 is phase-pure without any notable secondary phase. Compared to existing Li recycling technologies, which are generally complicated, time-consuming chemical and heating processes, the WTL system is straightforward and can be operated at room temperature without using any deleterious acid chemicals, thus opening a new avenue for cost-effective, eco-friendly Li-recycling systems. In this work, we report the fabrication of a new high voltage hybrid fiber supercapacitor (HFSC) with porous carbon coated carbon fibers (PC@CFs) as the negative electrode and copper hexacyanoferrate coated carbon fibers (CuHCF@CFs) as the positive electrode. Carbon fibers (CFs) were used as both the substrate and the current collector due to their good conductivity, high flexibility, good mechanical strength, and light weight. The as-fabricated HFSC can be cycled reversibly in the range of 0–2 V and exhibits excellent electrochemical performance with a specific capacitance of 19.2 F g−1 (68.2 mF cm−2 or 3.1 F cm−3) and an energy density of 10.6 W h kg−1 (180.85 μW h cm−2 or 8.11 mW h cm−3), better than those reported in the previous literature. Additionally, the HFSCs have retained their original electrochemical performance even after bending, suggesting good flexibility of the device. The promising results show great potential in developing HFSCs with CuHCF@CFs and PC@CFs electrodes for practical wearable devices. Cost-effective and eco-friendly battery system with high energy density is highly desirable. Herein, we report a seawater battery with a high voltage efficiency, in which a chloride ion-capturing electrode (CICE) consisting of Ag foil is utilized as the cathode. The use of Ag as the cathode leads to a sharp decrease in the voltage gaps between charge and discharge curves, based on reversible redox reaction of Ag/AgCl (at ∼2.9 V vs. Na+/Na) in a seawater catholyte during cycling. The Ag/AgCl reaction proves to be highly reversible during battery cycling. The battery employing the Ag electrode shows excellent cycling performance with a high Coulombic efficiency (98.6–98.7%) and a highly improved voltage efficiency (90.3% compared to 73% for carbonaceous cathode) during 20 cycles (total 500 h). These findings demonstrate that seawater batteries using a CICE could be used as next-generation batteries for large-scale stationary energy storage plants. Bifunctional catalysts are prominent to attain high capacity, maximum energy efficiency and long cycle-life for aqueous rechargeable Na-air batteries. In this work, we report the synthesis of bi-functional noble metal free, Co3(PO4)2 nanostructures by facile precipitation technique and evaluated its electrocatalytic activity. Co3(PO4)2 nanostructure was investigated as a potential electrocatalyst for rechargeable aqueous Na-air battery for the first time. The synthesized Co3(PO4)2 grain-like nanostructures showed better oxygen evolution activity compared to Pt/C catalyst. The fabricated Na-air battery with the Co3(PO4)2 catalyst as air-cathode delivered low overpotential and its round trip energy efficiency reached up to 83%. The Na-air battery exhibited stable cycle performance up to 50 cycles. High-purity micro-rod β-Na0.33V2O5 particles 2–5 μm in width and 3–10 μm in length are prepared by the chemical switch method. Electrochemical characterization demonstrates that micro-rod β-Na0.33V2O5 as a cathode material for lithium ion batteries provides high discharge capacity, good rate-capability, and cyclic stability. It delivers high discharge capacities of 297, 245, 220, and 178 mAh g−1 at current densities of 0.1, 0.2, 0.5, and 1 C-rate, respectively. The capacity fading rate is less than 1% per cycle, with high volumetric discharge capacities (504 mAh cm−3 at 0.1C and 301 mAh cm−3 at 1 C). Scanning electron microscopy images of the micro-rods during cycling indicate that they have excellent crystal structural reversibility in the voltage range of 1.5–4.0 V. These superior electrochemical properties are attributed to the tunneled crystal structure and internal pores formed by crystal defects in the micro-rods. With the recognition of metal–air batteries as promising candidates for clean and efficient energy storage, the development of inexpensive and effective bifunctional catalysts for the oxygen reduction reaction (ORR) and the oxygen evolution reaction (OER) has become one of the most important topics in this field. Herein, we designed new composite catalysts consisting of a nanorod type Nd0.5Sr0.5CoO3−δ (NSC) perovskite and edge-iodinated graphene nanoplatelets (IGnPs) as bifunctional catalysts for ORR and OER. Interestingly, the simple application of ultrasonication endowed the catalyst with a fascinating morphology comprising cloud-like IGnPs on NSC nanorods (NSC@IGnP). Benefiting from the unique morphological features, NSC@IGnP provides superior bifunctional activities toward both ORR and OER, remarkable cell performance, and exceptionally high stability for hybrid Li–air batteries. Na ion- Conducting Ceramic as Solid Electrolyte for Rechargeable Seawater Batteries. This study describes the assembly of a rechargeable seawater battery using hard carbon as the anode, seawater as the cathode, and a fast Na ion-conducting ceramic as the solid electrolyte. Two different Na ion-conducting ceramics, β″-Al2O3 and Na3Zr2Si2PO12 (NASICON), are used as the solid electrolytes in this study. The discharge capacity of the seawater battery with the NASICON solid electrolyte is 120 mAh g−1 after the first cycle and over 91% coulombic efficiency after twenty cycles. However, under the same experimental conditions, the discharge capacity of the seawater battery with a β"-Al2O3 electrolyte significantly drops to 10 mAh g−1 after one cycle. It is observed that the stability of NASICON in seawater is superior to that of β"-Al2O3 and impedance results of NASICON are not changed significantly compared to that of β"-Al2O3 after cycling tests. The stability of Na ion-conducting ceramics in seawater and their effects on the electrochemical performance of seawater batteries are presented and discussed. Graphitic Nanoshell/Mesoporous Carbon Nanohybrids as Highly Efficient and Stable Bifunctional Oxygen Electrocatalysts for Rechargeable Aqueous Na-Air Batteries. Efficient and cost-effective bifunctional electrocatalysts for oxygen evolution reaction (OER) and oxygen reduction reaction (ORR) are of vital importance in energy conversion and storage devices. Despite the recent progress in bifunctional oxygen electrocatalysts, their unbalanced and insufficient OER and ORR activities has continued to pose challenges for the practical application of such energy devices. The design of highly integrated, high-performance, bifunctional oxygen electrocatalysts composed of highly graphitic nanoshells embedded in mesoporous carbon (GNS/MC) is reported. The GNS/MC exhibits very high oxygen electrode activity, which is one of the best performances among nonprecious metal bifunctional oxygen electrocatalysts, and substantially outperforms Ir- and Pt-based catalysts. Moreover, the GNS/MC shows excellent durability for both OER and ORR. In situ X-ray absorption spectroscopy and square wave voltammetry reveal the roles of residual Ni and Fe entities in enhancing OER and ORR activities. Raman spectra indicate highly graphitic, defect-rich nature of the GNS/MC, which can contribute to the enhanced OER activity and to high stability for the OER and ORR. In aqueous Na–air battery tests, the GNS/ MC air cathode-based cell exhibits superior performance to Ir/C- and Pt/C based batteries. Significantly, the GNS/MC-based cell demonstrates the first example of rechargeable aqueous Na–air battery. Characterization of thin-film electrolytes for all solid-state batteries. In this study, amorphous lithium thio-germanate thin-films were prepared as electrolytes for solid-state lithium rechargeable batteries by using RF sputtering deposition in an Ar atmospheres. High quality lithium germanium sulfide, nLi2S + GeS2(n = 1, 2, and 3) thin-films have been successfully made by RF sputtering and synthesized as solid-state electrolytes. Although these materials are unstable in air the thin-films were thoroughly characterized by X-ray diffraction (XRD), Scanning electron spectroscopy (SEM), Raman spectroscopy, Infrared spectroscopy (IR), and impedance spectroscopy using special setups to prevent contamination. The ionic conductivities of the thin-films are ∼3 order magnitude higher than reported values for oxide thin-films. In this way, this work may provide a new way for developing new thin-film electrolytes for solid-state lithium ion batteries. Electrochemical properties of a ceramic-polymer-composite-solid electrolyte for Li-ion batteries. This study reports on the fabrication of a ceramic-polymer-composite electrolyte with liquid electrolyte, consisting of Li1.3Ti1.7Al0.3(PO4)3 (LTAPO) ceramic powder, polytetrafluoroethylene (PTFE) polymer and 1 M LiPF6 in EC/DMC liquid electrolyte. The morphologies of the LTAPO, LTAPO–PTFE composite membrane, and LTAPO–PTFE–LiPF6–EC/DMC composite electrolyte were analyzed using a scanning electron microscopy (SEM). The effect of the liquid electrolyte on the ionic conductivity of the prepared ceramic-polymer electrolyte was investigated using electrochemical impedance spectroscopy (EIS). The room temperature ionic conductivities of the LTAPO–PTFE–LiPF6–EC/DMC composite electrolyte and the LTAPO ceramic electrolyte exhibited 2.94 × 10− 4 S/cm and 8.36 × 10− 4 S/cm, respectively. The first charge capacity of the LTAPO–PTFE–LiPF6–EC/DMC composite electrolyte cell reached 118 mAh/g at 0.06 mA/cm2 current density. The electrochemical performance of the ceramic-polymer-composite electrolyte cell was better than that of the ceramic solid electrolyte cell. 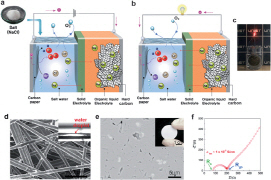 Eco-friendly Energy Storage System: Seawater and Ionic Liquid Electrolyte. As existing battery technologies struggle to meet the requirements for widespread use in the field of large-scale energy storage, novel concepts are urgently needed concerning batteries that have high energy densities, low costs, and high levels of safety. Here, a novel eco-friendly energy storage system (ESS) using seawater and an ionic liquid is proposed for the first time; this represents an intermediate system between a battery and a fuel cell, and is accordingly referred to as a hybrid rechargeable cell. Compared to conventional organic electrolytes, the ionic liquid electrolyte significantly enhances the cycle performance of the seawater hybrid rechargeable system, acting as a very stable interface layer between the Sn-C (Na storage) anode and the NASICON (Na3Zr2Si2PO12) ceramic solid electrolyte, making this system extremely promising for cost-efficient and environmentally friendly large-scale energy storage.